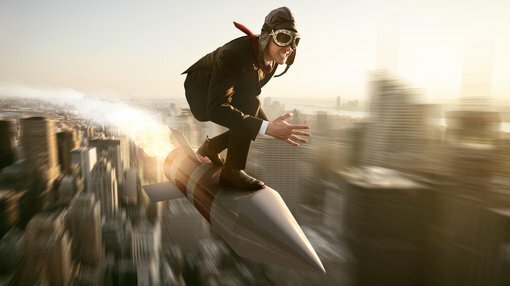 Berkeley Energia (ASX:BKY) is our stock of the week, and judging by the company’s share price performance in the first two weeks of the new year, it could well take out stock of the month. After closing out 2018 at 17 cents, the emerging uranium producer’s shares increased more than threefold to trade as high as 53 cents this week. It is worth noting, though, that even at these levels, analysts see significant upside, and it could definitely be argued that Berkeley was oversold in 2018 as sentiment towards the stock waned due to permitting delays. This is a function of the cumbersome and generally lethargic regulatory system which has even come under question regarding broader claims of corruption, which has resulted in many politicians being jailed. While this has been frustrating for Berkeley, it will be worth the wait when it brings the US$532 million Salamanca project into production as one of the world’s lowest cost uranium producers. While Berkeley hasn’t received all approvals for the project from Spanish authorities, media outlets last week suggested that the necessary approvals to progress the project may be imminent. Another factor that may well have attributed to renewed support for the company was a statement by management that selling of shares by a former major shareholder had now ceased. In terms of the media reports, this wouldn’t be the first occasion where incorrect information has been released which has radically impacted the share prices of ASX-listed companies operating in the country. In October last year, reports released indicated that the Spanish government intended to deny Berkeley the necessary permits to progress its Salamanca project. It was later confirmed that there was no substance to these reports, with the Nuclear Safety Council confirming that it wasn’t the source referred to by the media. What is well-documented and has been proven in legal proceedings is that corruption in Spain is rife, both at government and business levels. Indeed, if media organisations took positions in relation to the stocks they report on, the income generated would probably outstrip that generated from their media businesses. When these media reports surfaced in October, Berkeley’s share price halved before the company even had a chance to defend the claims. This occurred as global equity markets were unravelling, which created further downward momentum, resulting in the company’s shares hitting a 13 year low of 13.5 cents. This is completely unjustifiable, given the underlying value of the Salamanca project, but it is important for prospective investors to understand the extent of the risks, and in view of this, we’ve taken an extensive look at the challenges which are out of Berkeley’s control. The following comments were made in a report by global compliance services group, GAN Integrity: “Multiple cases of fraud, bribery and money laundering have emerged in urban planning and the construction sectors since the end of the Spanish building boom in 2008. “The magnitude and scale of the problem is exemplified by almost 1,800 judicial proceedings being opened in illegal land use cases in one year alone. POLITICO, a global non-partisan politics and policy news organisation, launched in Europe in April 2015, also highlighted the extent of the problem. The media group based in Brussels with offices in London, Berlin, Paris, Warsaw and Frankfurt, connects the dots between global power centres. In June 2018, an annual survey ranked POLITICO as the most influential publication on European affairs, for the second year running. Consequently, the following excerpt makes for disturbing reading in terms of companies trying to get a fair go in Spain. “A growing number of Spanish politicians and business leaders are ending their careers in an unexpected place - behind bars. “Almost 1,500 people in Spain faced trial for corruption between July 2015 and the end of 2016, according to official figures. Around 70% of them were found guilty. “Since the country’s transition to democracy in the late 1970s, those sitting on the defendant’s bench have included top business people, ministers, regional presidents, mayors and even Princess Cristina, the king's sister. “In the past few months alone, the entrepreneur Iñaki Urdangarín (Cristina's husband and King Felipe VI's brother-in-law) and former International Monetary Fund chief Rodrigo Rato were among those sentenced to prison. However, POLITICO noted in the same article that while corruption was the second most significant cause for concern in the country, the main problem was unemployment. And this is something that could well work in Berkeley’s favour, as the construction process and the running of the long-life Salamanca project would create many employment opportunities. Management estimates that 450 jobs will be created that are directly related to the mining operations, while 2000 indirect jobs are anticipated. The latter could relate to business opportunities in the local community to support the larger population, as well as the labour required across the transport and logistics areas. Another issue that falls outside management’s control is fluctuations in the uranium price, which usually impacts the share prices of companies exposed to the sector. For 30 years, Montel has been a key information provider for the European energy markets, specialising in independent market-moving news, data and analysis. It recently reported that French utility EDF is eyeing an expansion of all 19 of its French nuclear power plant sites, potentially through the acquisition of up to several hundred hectares of land. China is also looking to nuclear power generation to support its industries in coming decades. 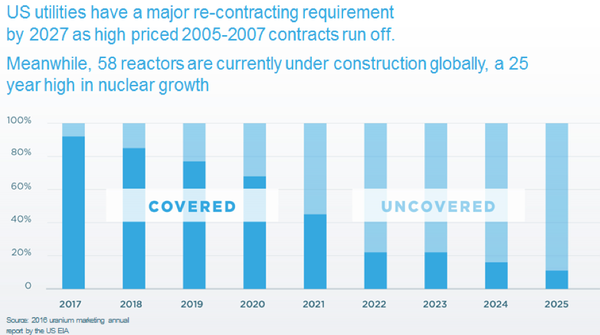 Activity in the sector generally is at a 25 year high, with Berkeley recently noting that there are 58 reactors under construction globally — and an additional 170 are planned over the next decade, and over 350 proposed by 2030. US utilities are approaching a period of recontracting as high priced 2005-2007 contracts finish. The increased activity and a positive swing in the forecast supply/demand equation have resulted in a robust increase in uranium pricing over the last 12 months. 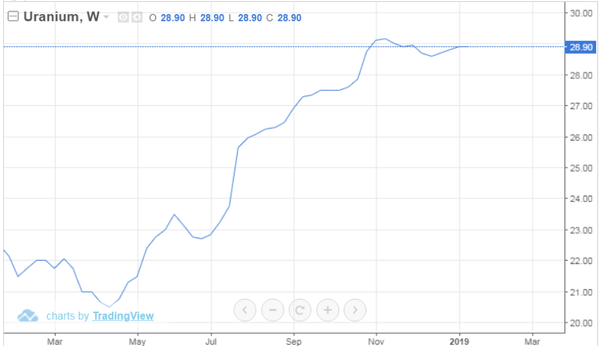 The increase of approximately 35% since April 2018 (US dollars per pound) is shown below. A key factor worth noting is that the uranium price continued to surge despite the volatile market conditions that prevailed in October. Since then, it has consolidated around the US$29 per pound mark, representing a near three-year high. 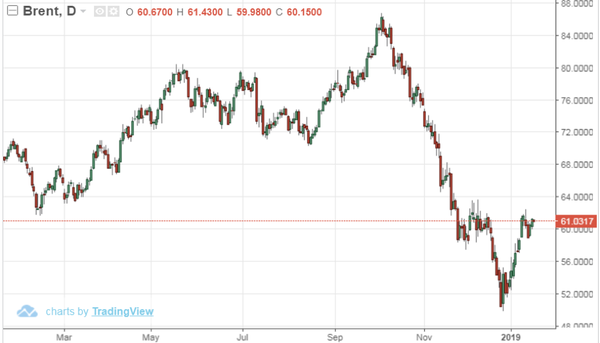 A glance at the Brent crude oil price chart certainly makes for an interesting comparison, particularly given both commodities fall under the broader energy sector. Analysts at Argonaut are bullish on Berkeley, noting that once permitting is finalised, the Salamanca project will be fully funded to commence construction of its first mine and processing facility at Retortillo, which is part of the greater Salamanca Uranium Project. Applying management’s production targets, the Salamanca project would rate highly on a global basis. The Argonaut broker recently noted that there are few developers with bankable projects and the requisite permits to commence development to meet the expected near to medium term uranium price recovery. “Most other uranium projects either require uranium prices above US$50/lb to warrant a final investment decision (FID) or have not attained permits to transition to development stage. “This puts BKY at a significant advantage to its uranium developer peer group, making it one of our key picks in the sector. Berkeley has 2.75 million pounds of U3O8 concentrate under long term contracts over the first six years of production. The potential exists to increase annual contracted volumes further, as well as extend the contracts by a total of 1.25 million pounds. Across the company’s portfolio, the average fixed price per pound of contracted and optional volumes is above US$42 per pound. The definitive feasibility study (DFS) has reported that over an initial 10 year period, the project is capable of producing an average of 4.4 million pounds of uranium per year at a cash cost of US$13.30 per pound and a total cash cost of US$15.06 per pound during steady state production. There is also exploration upside, with the company targeting further Zona 7 style deposits aimed at making new discoveries and converting some of the 29.6 million pounds of Inferred Resources into the mine schedule, with the objective of maintaining annual production at over 4 million pounds a year on an ongoing basis. The company is currently trading well shy of its 12 month consensus share price target of 99 cents.